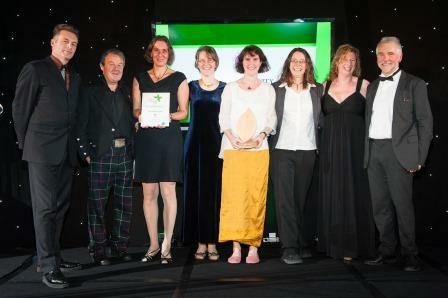 At a fabulous dinner and ceremony held at The Sheraton Grand Hotel in Edinburgh on 20th November, The Green Team were announced as winners of the Youth and Education category of the RSPB Nature of Scotland Awards. And were one of the shortlisted finalists in the Community Initiative Category too. Not a bad night’s work! Now in their third year, The Awards are designed to recognise and celebrate excellence, innovation and outstanding achievement in Scottish nature conservation. Over 300 guests attended the presentation dinner, hosted by naturalist, author and TV presenter Chris Packham. The youth and education category which was sponsored by Edinburgh University, was hotly contested and included The work of the John Muir Award amongst the finalists. The award is recognition of the long-running and sustained impact that The Green Team has made to the natural landscape of Scotland and the lives of thousands of young people. It is thanks to the hard work of all our participants, volunteer leaders, board and staff over the last 20 years that we now have this enviable accolade. It was particularly special for The Green Team that Peter Higgins, lecturer and highly respected author on play and outdoor learning, presented the staff with the award. Well done everyone!